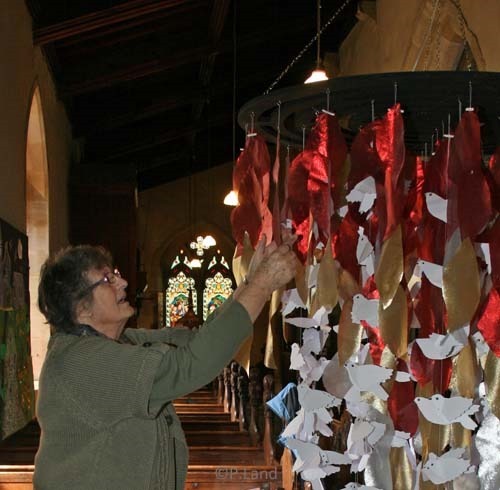 A visit to All Saints church at Ripley inspired Doreen Mason to create a magnificent and awe inspiring mobile for Aysgarth church depicting the life-changing message of Pentecost. 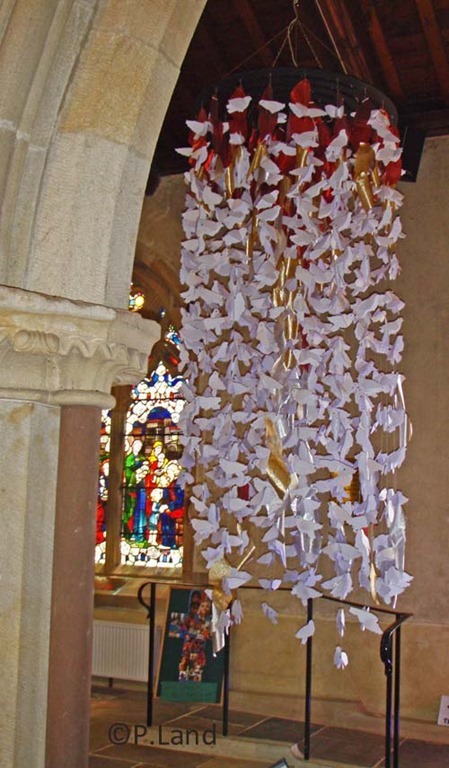 “At Ripley Angela Moore and I saw this mobile of angels in their belfry which was absolutely stunning,” said Mrs Mason. When they asked Karen Evans, who created that mobile, if she would mind if they did something similar she actively encouraged them. Mrs Mason and Mrs Moore decided they would like to do something in time for Pentecost and before the vicar, the Rev Sue Whitehouse, retired. Mrs Mason involved many others in creating the mobile. She explained: “Most of the ladies in the congregation and the children at three local schools – at Askrigg, Bainbridge and West Burton – contributed by cutting out doves. And then Paul Markie made us a very, very nice round wooden structure to hand them from. I strung most of them and lots of people helped to put it up. And it was up before Pentecost. And then Colin Bailey lent us the floodlight. For details of services at St Andrew’s, Aysgarth, see Penhill Benefice. Photographs: Above: Mrs Mason adding “flames” to the mobile. Below: Working on the mobile, and the finished display.